Laurence Aberhart. Christchurch 1976 [Avalon]. Laurence Aberhart was born in Nelson in 1949, moving to Christchurch in 1967 for Teachers’ College training. With graduation sending him away from the Garden City for his only posting as a teacher, he returned to Canterbury in 1973 and began to commit seriously to his self-taught profession of photography. In 1983, Aberhart moved to Russell in the Bay of Islands and has resided and worked there since.Of the sixty photographs of Christchurch and surrounding regions in the exhibition Aberhart Starts Here at Christchurch Art Gallery Te Puna o Waiwhetu (15 September 2017 – 6 February 2018), the majority of images span the years of 1975-83. This was an important period of growth in the adolescence of Aberhart’s two young daughters, Charlotte and Kamala, who feature in the occasional image while accompanying him on photography expeditions. Laurence Aberhart. New Moon, Christchurch, 1978. Aberhart’s extensive collections of photography have been well represented in exhibitions of iconographic imagery in his familiar mature style. A dominant figure in the art photography scene since the late 1970’s, his photographs were the subject of two major public gallery survey shows: Nature Morte, 105 Photographs, 1971-1989 at the National Art Gallery in Wellington in 1990 and Laurence Aberhart at City Gallery Wellington in 2007, both of which were toured nationally. ANZAC: Laurence Aberhart was an assemblage of over sixty prints of World War One memorials. Documented in Aberhart’s signature style of deep shadow and precise composition, ANZAC was organised by the Dunedin Public Art Gallery in 2014 and toured extensively. A single frame of this series (War Memorial, Dunsandel, Canterbury, August 1981) features in Aberhart Starts Here. While ANZAC reflects Aberhart’s commitment to specific documentation of a subject matter over three decades, Aberhart Starts Here, curated by Lara Strongman, provides a cross-section of eight visual themes from his early work. . While these themes allow the show to be easily digested and make the visual literature more accessible to visitors in a style that relates to Aberhart’s practice, they also limit the reading of individual images. 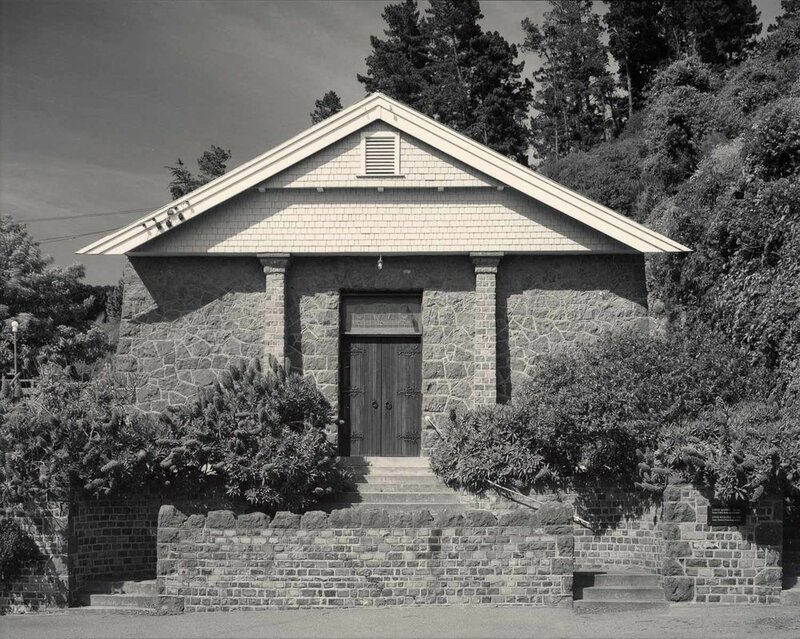 Organising photographs in the manner of a survey show encourages the viewer to take the work at face-value; an array of Masonic lodges in a line has the effect of encouraging one to skim for similarities or differences rather than observing the nuances in each picture as a work in and of itself. The accompanying publication, however, leaves more to the imagination – 60 photographs are included plus two that are only in the book 1 , and are arranged in a less structured format, by the date the image was made. Of the eight visual themes in the exhibition: colour works, masonic lodges, war memorials, interiors, flat-roofed stucco houses in the East of Christchurch, storefronts, and shadows of camera/photographer, the most striking are Aberhart’s ‘peopled landscape’ – an integral piece of Aberhart Starts Here which cements the show’s relevance as a significant exploration of the work of a practicing New Zealand photographic artist. Without this study of the rarely celebrated portraits of Aberhart’s collection, the exhibition would ride the fine line between relevant and nostalgic, teetering toward the latter – curated with a Christchurch audience very much at the forefront. Instead, these images which mostly feature Aberhart’s two daughters, Kamala and Charlotte and often their friends, have a very different mood than his other compositions, as if these children in the frame throw the whole photograph into a kind of romantic disarray. 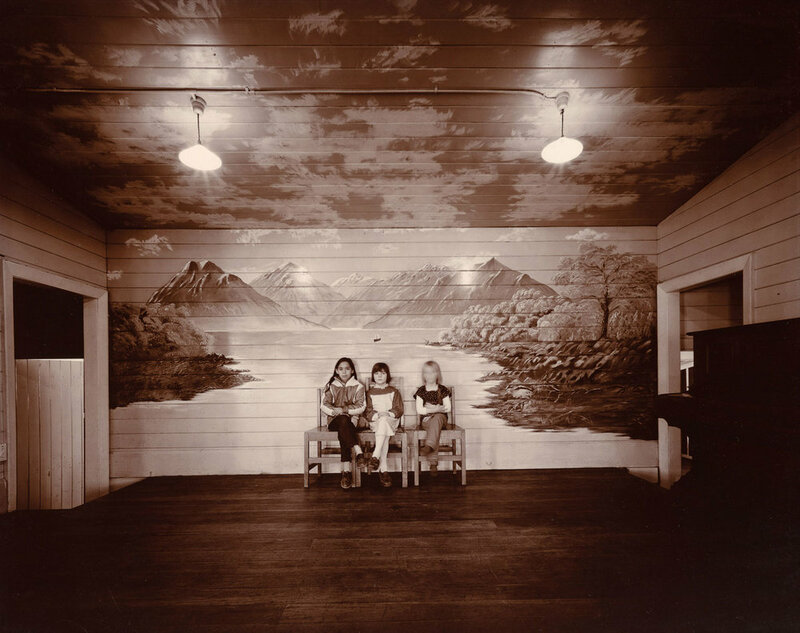 While lines are always structurally sound in the image-making, it is as though the figures add an entirely uncontrollable element – facial expressions, and movement captured by the slow shutter of the 5x7 inch camera he first used for “documenting vanishing architectural facades with large view cameras.” 2 These random elements are evident in Charlotte, Kamala and Popcorn, Lyttelton, September 1981 and Lesley, Kamala and Charlotte, South Springston, Canterbury, October 1980. Laurence Aberhart. Charlotte, Kamala and Popcorn, Lyttelton, 1981. Laurence Aberhart. 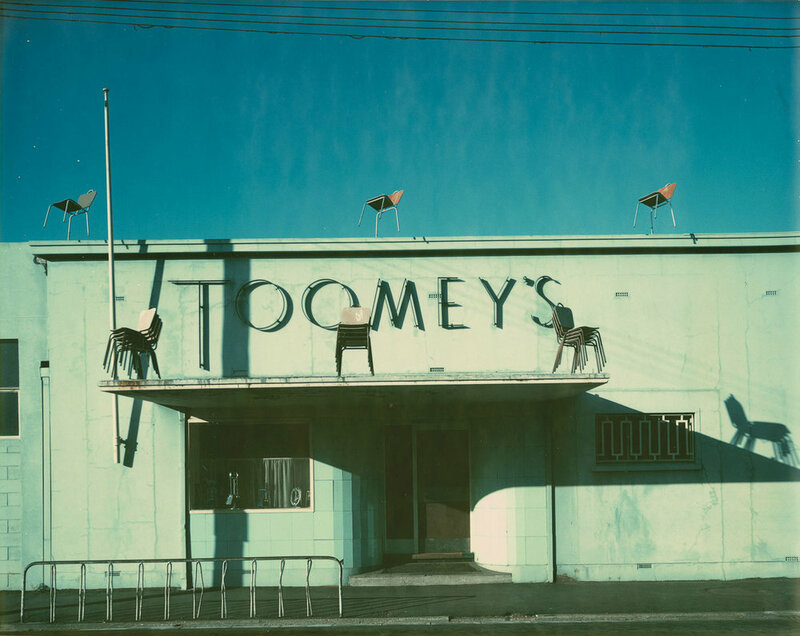 Toomey's, Ferry Road, Christchurch November 1979 - January 1980. The colour works which take priority at the beginning of the gallery as a ‘new’ element of Aberhart’s exhibited work, are still reminiscent of what one would expect of his iconographic black and white documentation, directly translated to colour – deep shadows, heavily saturated colour, turquoise/almost-black skies seen in Westport, November 1979 - January 1980, stark contrast and tight cropping in Toomey’s, Ferry Road, Christchurch, November 1979 – January 1980. The exclusion of Lodge Sumner #242, Sumner, Christchurch, December 1981 from the exhibition surprises me. This is an image that has the potential to encourage the visitor to reconsider their viewing of the work. In a line of many white stucco style lodges; the brick walls, columns and fences, the dense bush of #242, as opposed to manicured lawn, could have been an interesting punctuation point; a challenging contrast. 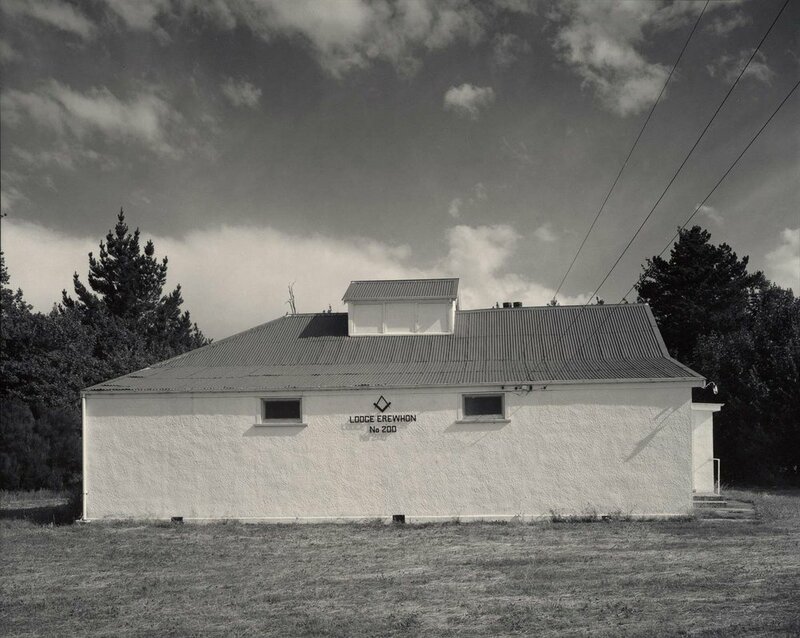 “The lodges have been neither a popular nor a commercial proposition for Aberhart, but he’s felt strongly about documenting them before they completely disappear from the social landscape,” states Strongman 3 , an approach which reflects American photographer James L. Enyeart in the Kansas Documentary Survey and in each of these cases, perhaps especially in Christchurch, the archive of the area is richer for this. Increasing this richness of the visual record are the photographs of interiors and quirky storefronts, which is where Aberhart’s humour comes to light. New Moon, Christchurch, 1978 is one of these. The signage and style of the exterior was enough to stop the artist in his tracks, to inspire him to embark on the endeavour of composing the image, preparing his camera and capturing on film the scene on his way home one evening giving us an insight into the photographers’ mind, into the thought process behind ‘documenting’ these parts of the city. Another example of this is in Interior #2 and Interior #3, Hop Yick Cheong, Christchurch, March 1983, a “spice-scented Chinese shop that [had] been trading in Christchurch for almost a century,”4 an Asian import business, it became the trendy café Supreme Supreme in mid-2015, subject to disappearing from memory without Aberhart’s record. Aberhart Starts Here presents some gems from the archive of one of New Zealand’s most important photographers. 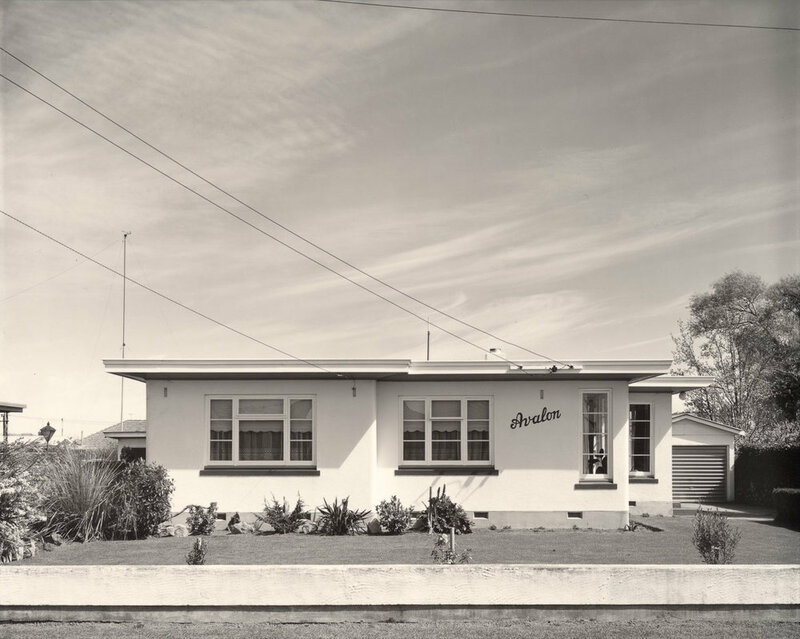 Challenging the impression one has formed of Aberhart’s style by presenting portraits and idiosyncratic interiors and storefronts, Christchurch has been treated to images which allow for a deeper appreciation of Aberhart’s practice. Lodge Sumner #242, Sumner, Christchurch, December 1981 and Domestic architecture, Christchurch 1976. Aberhart, in Luit Bieringa, The Active Eye: Contemporary New Zealand Photography, Manawatu Art Gallery, Palmerston North, 1975, p. 10. Strongman, Lara, Aberhart Starts Here, Lara Strongman and Laurence Aberhart, Christchurch Art Gallery Te Puna o Waiwhetu, Christchurch, 2017, p. 130. While completing her Postgraduate studies at the Ilam School of Fine Arts, Hannah Watkinson founded In Situ Photo Project, NZ's only public art space dedicated to the photographic medium. The vision for In Situ is to keep talented and intelligent individuals in Christchurch by providing opportunities for emerging artists, showcasing their work alongside that of established photographers. 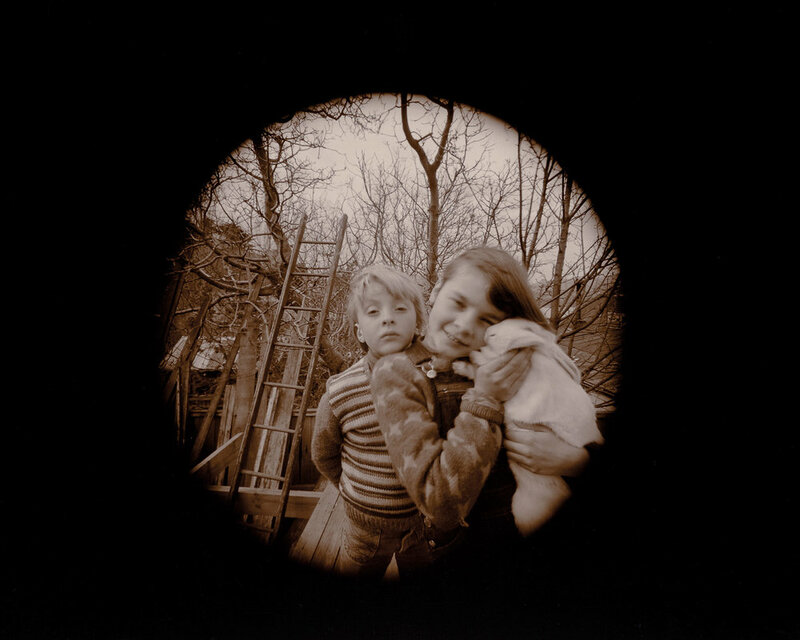 Her personal photographic practice considers the genres of fine art and documentary, attempting to communicate the psychological landscape and social-political environment through images.